Capital of the department which forms the western part of the French colony of Algeria; situated at the head of a bay on the Mediterranean. There are no records concerning the date of settlement of Jews there, but since the city was a center of commerce in the tenth century it may be supposed that Jews had been attracted to it earlier. 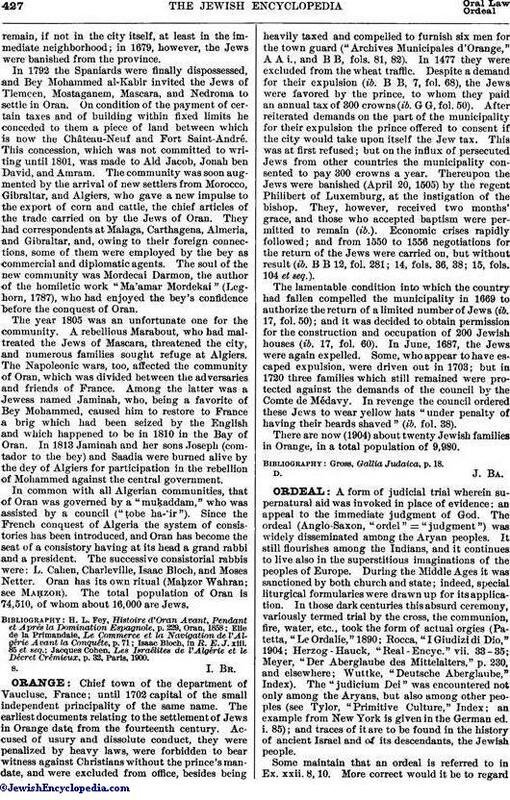 Like all the Jews of Mauretania, those of Oran suffered many vicissitudes of fortune during the dominion of the Arabs; fairly treated by the dynasties of the Aghlabites and Almoravides, they were cruelly persecuted by the fanatical Almohades, so much so that many emigrated to the East, while many others embraced Islam. In 1509 Oran fell into the hands of the Spaniards, who seem to have allowed the Jews toremain, if not in the city itself, at least in the immediate neighborhood; in 1679, however, the Jews were banished from the province. In 1792 the Spaniards were finally dispossessed, and Bey Mohammed al-Kabir invited the Jews of Tlemçen, Mostaganem, Mascara, and Nedroma to settle in Oran. On condition of the payment of certain taxes and of building within fixed limits he conceded to them a piece of land between which is now the Château-Neuf and Fort Saint-Andreé. 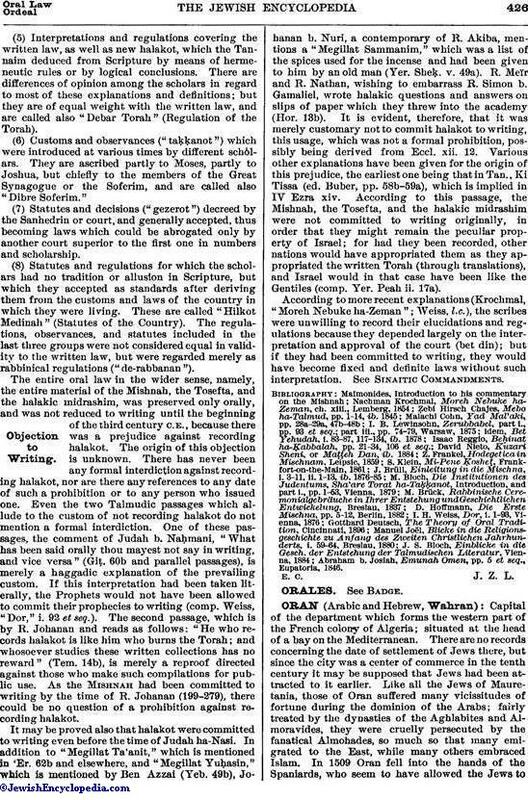 This concession, which was not committed to writing until 1801, was made to Ald Jacob, Jonah ben David, and Amram. The community was soon augmented by the arrival of new settlers from Morocco, Gibraltar, and Algiers, who gave a new impulse to the export of corn and cattle, the chief articles of the trade carried on by the Jews of Oran. They had correspondents at Malaga, Carthagena, Almeria, and Gibraltar, and, owing to their foreign connections, some of them were employed by the bey as commercial and diplomatic agents. The soul of the new community was Mordecai Darmon, the author of the homiletic work "Ma'amar Mordekai" (Leghorn, 1787), who had enjoyed the bey's confidence before the conquest of Oran. The year 1805 was an unfortunate one for the community. A rebellious Marabout, who had maltreated the Jews of Mascara, threatened the city, and numerous families sought refuge at Algiers. The Napoleonic wars, too, affected the community of Oran, which was divided between the adversaries and friends of France. Among the latter was a Jewess named Jaminah, who, being a favorite of Bey Mohammed, caused him to restore to France a brig which had been seized by the English and which happened to be in 1810 in the Bay of Oran. In 1813 Jaminah and her sons Joseph (comtador to the bey) and Saadia were burned alive by the dey of Algiers for participation in the rebellion of Mohammed against the central government. In common with all Algerian communities, that of Oran was governed by a "muḳaddam," who was assisted by a council ("ṭobe ha-'ir"). Since the French conquest of Algeria the system of consistories has been introduced, and Oran has become the seat of a consistory having at its head a grand rabbi and a president. The successive consistorial rabbis were: L. Cahen, Charleville, Isaac Bloch, and Moses Netter. Oran has its own ritual (Maḥzor Wahran; see Maḥzor). The total population of Oran is 74,510, of whom about 16,000 are Jews. Jacques Cohen, Les Israélites de l'Algérie et le Décret Crémieux, p. 32, Paris, 1900.